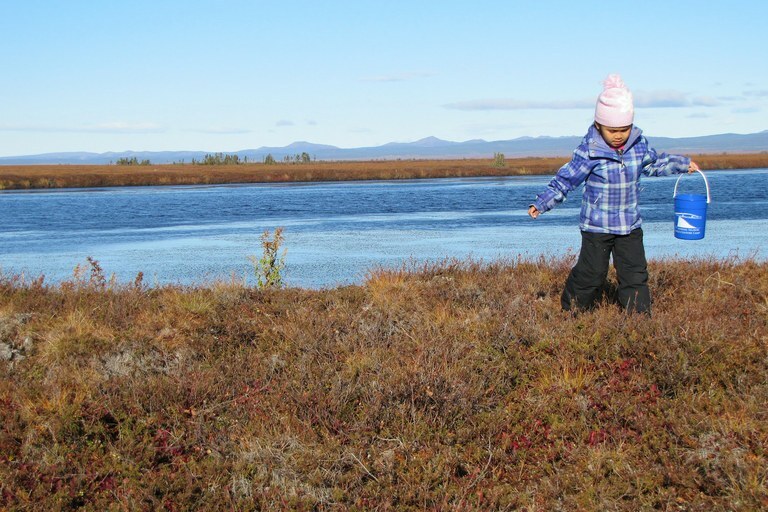 A child from the Iñupiaq village of Selawik walks near the shore in northwest Alaska. The community faces coastal erosion from climate change. Though Indigenous communities have a small carbon footprint, they are often the most severely impacted by climate change. There are 567 federally recognized tribes in the U.S. — 40 percent of them in Alaska — and climate change threatens many of them. In California and the Pacific Northwest, tribal nations are at increased risk of sea-level rise. Coastal communities like the Quinault Indian Nation in western Washington and at least 31 Alaska Native villages, including the Shishmaref village near the Bering Strait, face the danger of coastal erosion. Already, several have been forced to relocate. Around the Southwest, heat and drought are baking streams and shifting sand dunes, leaving the Navajo Nation and other tribes and pueblos with fewer resources, while wildfires endanger tribal nations from eastern California to the Rocky Mountains. Primary food sources, like salmon and other endangered fish, are dying from acidifying and warming oceans. On June 3, just two days after Trump made his announcement on the Paris Agreement, the Swinomish Indian Tribal Community joined the Standing Rock Sioux Tribe, the Quinault Indian Nation, and the Central Council of the Tlingit and Haida Indian Tribes of Alaska in committing to support the agreement. The National Congress of American Indians and the Native American Rights Fund did so as well. Their decision to publicly announce their support is more than symbolic, experts and leaders say: It tells the United Nations that tribal nations are climate leaders and intend to remain part of the global conversation about climate change. Though tribes and states are sovereign entities within the U.S., they are not allowed to enter treaties or negotiate with foreign nations. Under United Nations policy, Indigenous people are treated as self-determining when it comes to cultural issues, but lack the political self-determination of member nations. The 2008 United Nations Declaration on the Rights of Indigenous Peoples allows tribal communities to participate in U.N. matters. Signing an agreement like the 2015 Paris climate accord, however, would require changing policies at the U.N. and in the U.S. Tribal leaders say it’s possible. “Just to have them recognize us was a step in the right direction,” said Brian Cladoosby, president of the National Congress of American Indians. But changing the law is an arduous process, so tribes in the U.S. are taking a short cut: working more closely with Indigenous populations from around the world through programs like the United League of Indigenous Nations, which has its own climate program, or the International Indigenous Peoples Forum on Climate Change. “Tribes are really trying to get out there and represent themselves, and become stronger partners in agreements where U.S. representation isn’t necessarily good for them, like the Paris Agreement,” Whyte said. According to Whyte’s research, more than 50 U.S. tribes have engaged in formal climate change planning, and many have had climate adaptation plans approved by their councils. In addition to assessing larger climate goals, tribes are working on the ground to address the impacts. The Swinomish have partnered with the Skagit Climate Consortium to protect the region’s salmon from pollution and warming waters. In Southeast Alaska, the Tlingit and Haida Indian Tribes are monitoring ocean acidification levels and harmful algae blooms while adapting buildings and infrastructure to cope with rising sea levels along rivers and the coasts. Since 2008, the Pueblo of Jemez in New Mexico has been working on small and utility-scale solar projects, as well as biomass and geothermal energy projects. Last September, the Samish Indian Nation in Washington landed a grant from the Bureau of Indian Affairs for climate adaptation planning and education. But funding is increasingly uncertain: Another Department of Energy grant that arrived this summer was five months later than expected. Trump’s federal budget proposal would cut tribal climate resilience award money by $9.9 million, and in June, the Bureau of Indian Affairs scrubbed all references to “climate change” from the agency’s website about the Tribal Climate Resilience Program. Whyte noted that many tribes may not be able to start renewable energy projects alone; usually, an investment from the federal government is needed. This article originally appeared in High Country News on July 14, 2017. Lyndsey Gilpin is a former HCN fellow and the editor of Southerly, a newsletter covering environmental and cultural issues of the American South.